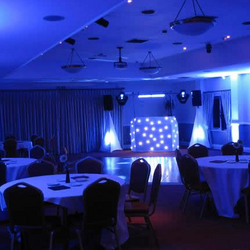 Marquees are the ideal setting for our LED uplighting, where you can replace standard white halogen lighting, with the rich, vibrant colours produced by LED par cans. Our new stock of high powered 3W LED par cans are even visible in daylight! The beauty of LED technology means that by mixing Red, Green, Blue and White LEDs, thousands of different colours can be created. 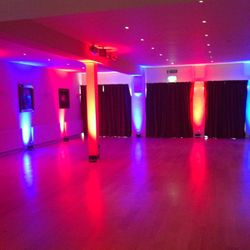 Each light can be individually controlled, so its possible to have one single colour throughout the room, or alternating colours, or even a random assortment. We can create any effect you like, the only limit is your imagination! As well as basic LED uplighters our stocks now include extra bright 3W Tri-LED pars which are even visible in daylight and look fantastic in marquees or venues with dark or panelled walls and those with high ceilings. 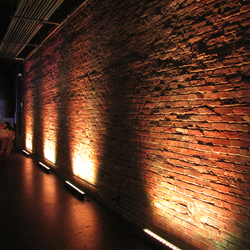 We also hold a stock of 1m LED bars which are ideal for when you want to completely colour a wall or you have limited space available. 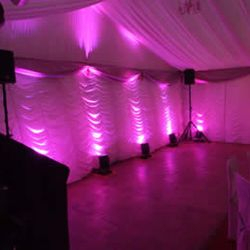 Our lights are unique, in that they don't get hot and they consume very little power, which makes them an ideal and affordable option for your upcoming event. 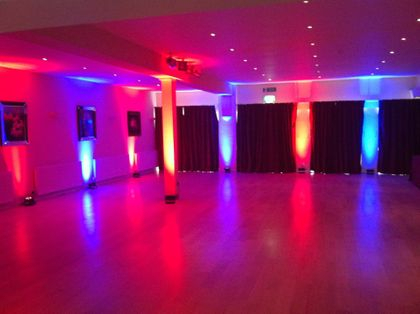 LED uplighting can be integrated with our other lighting services, and when booking an operator for the evening, they'll have full control over all the colours and patterns.